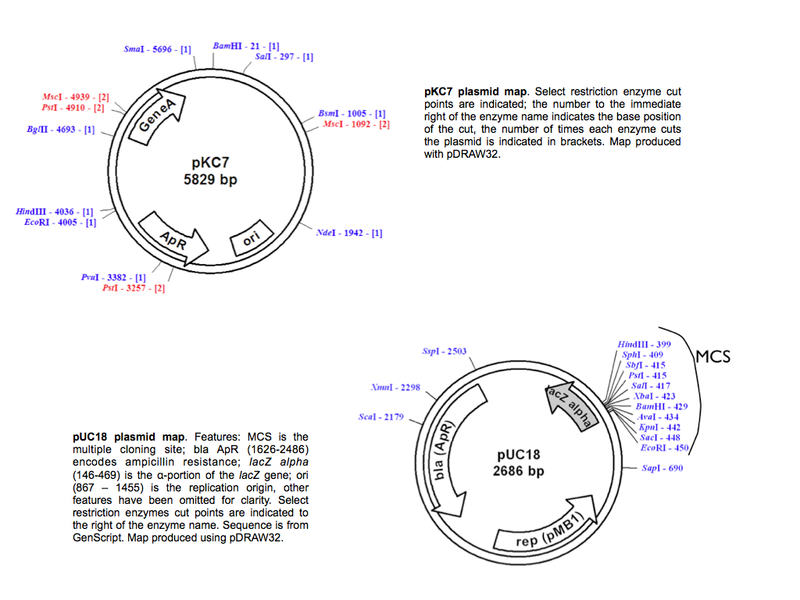 The first step is to obtain several micrograms of the two plasmids we will be working with, pKC7 and pUC18. The easiest way to obtain plasmids is to let bacteria make them for us. Once the bacteria have produced the plasmids we simply isolate the plasmids from the rest of the bacterial contents. See Plasmids and Vetors for more about plasmids. Both plasmids are harboured in Escherichia coli. To isolate the plasmid DNA we will use the Thermoscientific™ GeneJET™ miniprep kit. Kits are designed to be easy to use, but you – the researcher – still must understand how the kit works. This means reading all the background material for the kit. The isolated plasmids will then be digested using the restriction enzymes BamH I and Hind III. For why see Project Overview Step III. In order to set up the digest, you need a rough idea of how much DNA you need for the downstream steps as well as the concentration of the DNA you are using. At this point you don't know either, but based on a typical plasmid yield, we can make a decent guess at how much plasmid we will need to digest. A kit is a commercially prepared set of components, packaged together for use in a specific protocol. Determine what the purpose of each of the steps in the purification protocol accomplishes and where the plasmid DNA is at the end of each step. It will also be helpful to know what a plasmid is and the difference between plasmids and genomic DNA. You will be quizzed later in the semester on how this protocol works. Find the protocol for the GeneJET™ plasmid miniprep kit. Obtain protocol directly from Thermoscientific. The manual tends to get moved around but last time I looked it was near the bottom of the page, under the tab "resources". The manual should be about 10 pages long. The link was called "GeneJET Plasmid Miniprep Kit Product Information". Don't be afraid to click around a bit. Print the GeneJET™ plasmid miniprep kit protocol and bring it to the lab (we will check that you have brought the correct protocol with you). Print the product information sheets for HindIII and BamHI found at Thermoscientific (we will check that you have brought the correct protocol with you). Hint: look under resources once you get the page for the specific enzyme. Please make sure to look up the conventional restriction enzymes, NOT the FastDigest enzymes. Make a list of the materials you will need to complete this weeks lab (you will hand in this list so make a second copy for yourself). Project overview - Step I - III. Please carefully review all protocols before coming to lab - if any of the steps are not clear to you please ask before the lab (contact Lauri or post a comment below) or ask during the pre-lab). How to keep a notebook – Bring an appropriate notebook to lab this week. GeneJET™ plasmid miniprep kit. Obtain directly from Thermoscientific as described in assignment 1. Details on how to set up restriction digests are available from the enzymes manufacturer. Thermoscientific puts this info in their "enzyme product insert" sheet. Find a print the information for HindIII and BamHI at Thermoscientific. Hint: look under resources once you get the page for the specific enzyme. Please make sure to look up the conventional restriction enzymes, NOT the FastDigest enzymes. All buffers have been prepared as required (see Important Notes in the GeneJET protocol) and the cultures have been prepared for you as described in step 1 of Growth of Bacterial Cultures (both cultures were grown in LB medium supplemented with 100 µg/ml ampicillin). You are starting at step 2 of Growth of Bacterial Cultures (this protocol is in the GeneJET manual and proceeds the plasmid isolation protocol). Set up a double digest with the conventional restriction enzymes HindIII and BamHI using the following information. You will need to calculate the appropriate volumes of each component and fill it in the table below. We will check your table for accuracy before you set up the reaction. Both enzymes are supplied by Thermoscienctific at 10 units per µl. Final buffer concentration is 1X for both enzymes. Answers do not need to be submitted. Why are we starting with more bacterial culture for the pKC7 plasmid isolation then the pUC18 isolation? Both plasmids are being digested in a total volume of 20 µl, but we are using only 5 µl of pUC18 and 15 µl of pKC7. Why? Define a restriction enzyme unit. What is the best buffer to do the double digest in?